Here it is, the mother of all dream dictionaries. A complete reference source for dream interpretation written by an expert with a gift for teaching how to do it. It’s a guide to your dreams, showing step by step how to understand their meaning and significance. It’s an encyclopedia of dream psychology so you fully grasp key concepts and methods. And of course it’s a dictionary of the most important and common dream symbols, featuring in-depth explanations and extensive examples and showing how to reach the same conclusions for yourself. 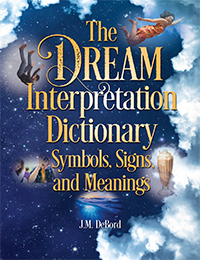 The mother of all dream dictionaries is not just a dictionary, it could quite possibly be the world’s largest instruction manual for dream interpretation. It’s 480 pages chock full of dream knowledge. Plus hundreds more, drawn from the author’s 25 years of experience at dream interpretation. The more than 750 entries cover subjects such as nightmares and recurring dreams, celebrities and holy figures in your dreams, crime and killing, aliens and UFOs, violence and conflict, Facebook and computers, school and work, significant others and relationships of all types. It helps you understand why you dream about ex loves, old friends, family homes, and other people and places from your present and past. It gives instructive explanations of the psyche and the process of dreaming, and explains archetypal themes. And the entire book is stocked with vivid examples drawn from the dream lives of people from around the world that the author engages with on media programs, in lectures, and online at the massive social media site reddit.com, where he is known as RadOwl the dream expert. Best of all, while clearly written and easy to use for beginners, it has the depth and comprehensive approach to each dream symbol to enlighten experts. It teaches that dreams are stories that help you better understand yourself, with the goal of making you a healthier, happier, more creative and more complete person. Break down the dream into story elements and narratives components. Use interpretation techniques to analyze the symbolism and the story. Build up the interpretation by considering context and making connections. Three steps to a lifetime of exploring your dreams. Are you ready? This dream dictionary tells me things I did not know before … I was completely taken with the wealth of meaning … In my eyes that makes this dictionary stand out among others.– Dutch psychologist Drs. Susanne Van Doorn, author of A Theory of Dreams and A Dreamer’s Guide Through the Land of the Deceased. I dream about my Grandma a lot & every dream I have of her is like she’s never died even though she has. Dreams can be so realistic. I hope you can treat the dreams you have about grandma as experiences of seeing her again. Helo I had a dream of me and my late husband sleeping in our bedroom me telling him let hold you because I know when I wake up you will be gone i kissed him on his forehead crying he was also crying when I woke up I found myself crying does it mean he was here with me. The emotions you felt and saw from your late husband are not part of the next life, to my knowledge. Emotions come from the body, and when you leave behind your body you leave behind your emotions. It’s not to say that in spirit we are emotionally dead. The way I understand it, we simply know that we are encompassed by love and there’s nothing to be upset about. That’s why my hunch is the character in your dream is acting out your emotions. The dream is helping you to release the emotions and keep the memory of your husband alive within you. This is healthy. I always dreamt that my boyfriend was leave me. So i am scared because i cant live without him. Im just confusing that its always in my dream. Why is the meaning of this? I am scared to dream it!. Dreams will confront you with your fears. Think of it as a simulation. The dream shows your boyfriend leaving you and you react how? With fear. You learn something about yourself through your reaction. The implication is you need to look closely at the source of this fear and meet it with courage. Where is the insecurity coming from? Has your boyfriend given you reason to think he’ll leave you, or is it insecurity talking? I feel ya. I experienced a lot of insecurity while growing up and later sought it in my relationships. But it’s unfair to put that burden onto a partner. Take or leave everything in life. Nothing is guaranteed. You can love passionately and care deeply without needing anything in return. My guess is there’s a deeper capacity in you for loving and caring that’s waiting for you to create your own security. You’re stuck, though, by a personal need that’s unmet. Begin by picturing the dream and the scene where your boyfriend leaves. Now tell the dream character that it’s all right, you’ll be all right, that you love him and understand that most things don’t last forever and you are a strong person who can live without him. Say it like you mean it. Feel it. If you can’t say it like you mean it, explore your feelings and look for the root of the feelings. Then let them go like a bubble that floats up and away. Remember, all of your dream characters are like actors in stories. They follow the script. The script in this dream tells a story that shows you a fear that needs to be met with courage. It doesn’t mean your boyfriend is really going to leave you. However, some things have a way of becoming real because we fear or avoid them. Your best bet is to confront it head on. There’s something very personal for you going on in this dream that’s difficult for me to put my finger on. Houses can represent your emotional life, among other things, so to be in a stranger’s house can symbolize feeling out of sorts. Or you are in a strange place in your life. Your prayer in the dream really could be key to understanding it because why do you say that prayer? When something feels wrong. Start there. What feels wrong to you right now? Have you lacked the energy you need to be the parent you want to be for your son? I ask because in the dream you want to go to sleep, which can mean that you need rest. Plus, the woman is in the kitchen. Food is associated with energy. When the woman says something’s wrong with the gravy you made earlier, perhaps it’s a way of saying you aren’t feeding yourself what you need to keep up your energy. Helo again this time I had a dream of a lot frogs in my house and dark in the dream I was trying to chase them out in the name3of Jesus but it kept appearing the next night dreamed again of af dog full of ticks and I washed it of and put tick powder on the dog and the ticks died and fell off. Frogs were used in Biblical plagues so to try to rid yourself of them in a dream by calling upon Jesus could mean there’s some sort of bad influence or character trait you are trying to rid yourself of. Your house can symbolize your life or yourself (your mind, body, emotions). The dog full of ticks…same idea, except also consider the possibility of the dog representing a friend or companion. Ticks are what? Parasites. You know what spiritual parasites are. Symbols are best understood in the context of the dream-story so we need more detail to take a good guess at what fire falling from the sky can symbolize. It could mean that your thoughts (sky) are burning up (fire). It could mean something has “caught fire” in your mind, such as an idea, desire, or creative endeavor. It could mean you have experienced a sudden change that came out of nowhere. It could be a warning to look above you in your dwelling for fire hazards. I was walking and fire fell like hail rain from the the sky I remember thinking it’s the of the world bit feeling it’s not. With that detail about feeling like it could be the end of the world, we have some context to understand the dream imagery of fire raining from the sky. To me, it’s a way of saying that the time for change has come. Something about you and your life is changing, or needs to change. Your reply slipped under the radar. Is it good or bad? Well, the dream imagery itself is dramatic but that’s just the nature of dream imagery. I think it’s neutral in the sense of just expressing what you feel. Your husband died and your life fell apart. That’s understandable. I feel for you. My mother in law did home hospice with my wife and I and she died in May. It’s been a struggle to put back together the pieces. But it’s something you do to honor the memory of the person you love. You owe it to them and to yourself to pull together the pieces and reach a place inside yourself where you’re ready for what comes next. Congratulations on your new book. I can imagine how many hours you have put into this. I was completely taken with the wealth of meaning you attach to each symbol. And with the open-ness that you suggest to people to play around with those meanings. In my eyes that makes this dictionary stand out among others. I appreciate that you notice. As an author it’s hard to know if you accomplish what you set out to do in your books, and my goals with this one are to show the wealth of possible meanings presented by dream symbols and how to personalize them. I’d love to see these words you wrote about my book as a review at Amazon. It’s exactly the sort of endorsement that tells people this is no ordinary dream dictionary.